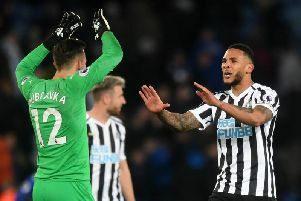 Antonio Barreca impressed his Newcastle United team-mates in his first training session. The left-back joined the club on loan from Monaco on transfer deadline day. Newcastle also signed Miguel Almiron from Atlanta United in a £21million deal. Barreca, unlike Almiron, is eligible to play in this afternoon's game against Tottenham Hotspur at Wembley. And the 23-year-old caught the eye in training yesterday. Benitez – who kept midfielder Isaac Hayden at the club – says the players are even more "positive" following the arrivals of Barreca and Almiron, who is ineligible to train and play while he waits for a work permit. "For me, we have two players we didn’t have," said United's manager. "I’m happier than before. Why? We have two players we didn’t have. "Also, Hayden. I had the conversation with him the other day. He was fine. He knew what he wanted. "He was a very good professional. He's quite happy to stay here, and has shown his commitment in the games. It’s another positive. "Then you have the other players – you can see they are more positive. They can see. We were training, Barreca was doing well. I was a player. When you see someone new come and he’s doing things right, you think 'ah right, OK”. "But that’s good for the team. "I think everybody is a little bit happier, we won and we have two new faces."